A pair of bison advocates have been arrested after chaining themselves to a chute in Stephens Creek. It’s the latest round of protest against bison operations in Yellowstone National Park. According to park spokeswoman Vicki Regula, speaking to the Bozeman Daily Chronicle, park rangers spotted the pair around 5:30 am this morning. They were arrested shortly thereafter. The news comes after bison being kept in the facility were released through a cut fence on Thursday, February 22. It was the second incident of its kind this year; the first happened in mid-January. The National Park Service has opened a criminal investigation into both fence cuttings. The park also announced they would increase security around the facility but did now say how. “The main point of this action was to draw attention to the fact that there’s really minimal numbers of wild buffalo being kept in the park,” Luke said. The group added that a third person has been arrested as well, though it did not say why, according to the Chronicle. Yellowstone bison are hunted and slaughtered under the Interagency Bison Management Plan, which calls for the park herd to be reduced and kept in park boundaries, for fear that they’ll spread brucellosis to neighboring cattle. This policy is fiercely criticized by environmental and bison advocacy groups as cruel and unnecessary. To date, there has never been a documented case of bison-to-cattle brucellosis transmission. Research shows elk are far more likely to transmit the disease to cattle. Although Yellowstone corrals bison in preparation for slaughter, park officials have called for alternative measures like quarantining bison and clearing them of brucellosis. Once cleared, they could be shipped out of the park to other herds. Many conservation and tribal organizations have expressed interest in Yellowstone bison for their unique genes and relatively wild condition. The park announced this summer it would convert part of Stephens Creek into a bison quarantine facility. At the time of the February fence cutting, Montana state veterinarian Marty Zaluski announced he expected the facility would be certified imminently. Although quarantine has been embraced by some groups, some bison advocacy groups have criticized it as an overt attempt at domesticating Yellowstone’s bison. Besides the chute protest, there have been other efforts this winter to halt bison operations in the park. Last week, a Bozeman law firm sued to block bison hazing north of the park, arguing that conditions around Gardiner constituted a public safety hazard, which could be alleviated if bison were allowed to move north of Yankee Jim Canyon. Meanwhile, in early February, a federal judge sided with bison advocates arguing the U.S. 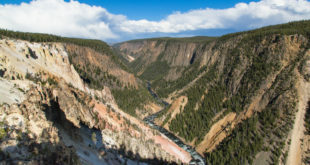 Fish and Wildlife Service had not adequately considered whether Yellowstone bison merit protections under the Endangered Species Act. The agency must now issue a new finding within 90 days of the ruling. The decision is anticipated around May 2018. UPDATE: Additional information has been released about the protesters. Read the full story here.